In flash animation a flyer aimlessly breezes through St. Jimmy’s small town and into its square, landing under the original punkster’s boot. 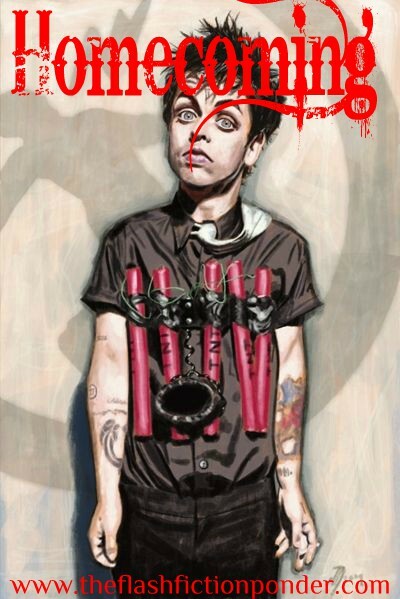 12th anniversary of St. Jimmy Day! Revealing not St. Jimmy in those boots of his, but a 12-year-old punk wearin’ ‘em and PLAYING the icon’s GUITAR as we slowly fall back to a wide shot of the empty town’s square, the kid with his back to a towering statue of St. Jimmy. From one candle being lit to another, fall back to countless. A storybook, entitled ‘Last Days of St. Jimmy’ is opened. One day jitters into another as St. Jimmy does time in a prison cell. Crouched down in one of his four corners he reads a letter. St. Jimmy is released, a smile growing across his face as his girl (the meter maid) runs up and gives him a hug. They, along with the rest of the town, celebrate his homecoming at the local bar. He lifts a bottle of booze and gulps down hopes of drowning his fears. Out on the balcony he continues chugging the temporary fix. Worse than what he looks like in prison, St. Jimmy stares at himself in the mirror. Where a flashback of his father beating him plays out. Jimmy and his girl constantly fighting in their not-so-happy little home. Extreme close-up, the hand which bears the tat in its web, St. Jimmy pulls the hammer back on a revolver. Then lightly showering down upon the body of water. Quick fall back shows her in the doorway, liquid splashing to the ground as her water breaks. A coming to a rest in the town square. His mom exhaling her last breath as she leaves this life due to the spawn of St. Jimmy. In fast-forward Jimmy Jr. grows/ages right there in the town’s square to the age of twelve, his father’s infamous guitar in his hands/the oversized boots on his small feet as the townspeople simultaneously erect a statue of the icon at the kid’s back. To reveal a cig dangling from twelve-year-old Jimmy Jr.’s mouth as he gets marked. Picks up his inherited guitar and heads out. A large poster of the iconic St. Jimmy towers in low angle during ACOUSTIC STRINGS. He finds himself atop the town’s bridge, at the very spot where daddy sprayed his brains across the bay. AS BELLS COME IN we slowly push in on an apartment above a storefront, large plate glass window just like its counterpart below. sSill on wide shot of window the silhouette is now to the far right, isolated and lonely. And SIGHS as he accepts it and starts PLAYING/PERFORMING as if it never left him. He PERFORMS on a stage at a club. On the edge of what is now St. Jimmy town (as welcome sign says) Jimmy’s ol’ bandmates back his offspring as they and Jimmy Jr. PERFORM atop a float, all the townspeople there to welcome their Prince of Punk son home as all march towards town. Which shows on the emotionally-moved faces of his punk people.